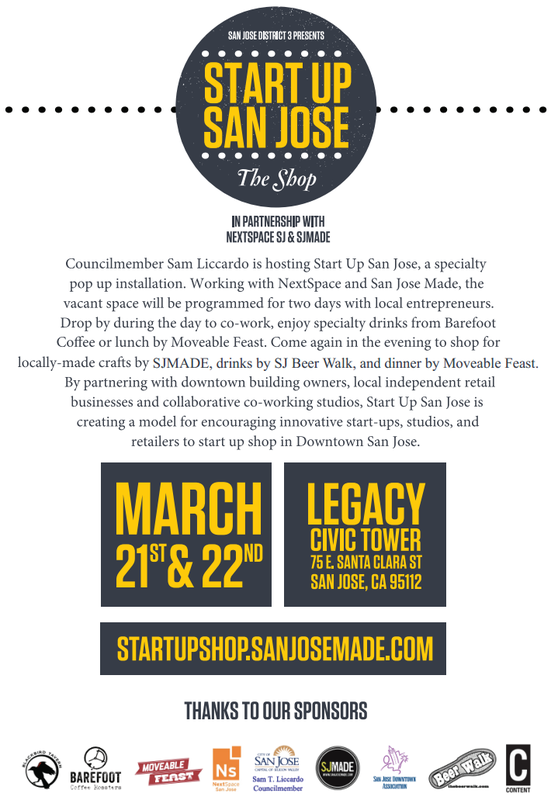 The San Jose Blog: Start Up San Jose Event Kicks off Tomorrow! Start Up San Jose Event Kicks off Tomorrow! A slew of key Downtown establishments are getting together to push Start Up San Jose. The goal of this event is to fill up vacant retail space in Downtown San Jose, which will create a more vibrant and safe Downtown. The event is being championed by Councilmember Sam Liccardo, along with NextSpace and SJMADE. A vacant floor space at 75 E. Santa Clara Street is going to be brimming with San Jose entrepreneurs tomorrow and Friday. You will be able to swing by and check out some Moveable Feast food trucks, local products from SJMADE vendors, grab Barefoot coffee, or even work for a bit in a coworking space hosted by NextSpace. At night you will even have an assortment of beers to sample thanks to Beerwalk. Next door is a really slick assortment of local vendors at Sperry Station, a new project that is well worth checking out. For more information click here.